Getting hit in the groin is never a pleasant experience. In order to prevent or at least reduce the pain the that comes with getting hit down below, a protective gear such as insert cups, Thai steel cup or a no-foul groin protector should be worn in sparring sessions. This article will review one product from the latter category, specifically the Title Boxing Groin Protector Plus. Title Boxing Groin Protector Plus model utilizes a low profile design for protecting your groin and pelvic area. Furthermore, the company Title states that this protective gear is approved for use in USA boxing and Golden Gloves competitions. This item is commonly worn outside an individual’s shorts for sparring sessions occurring inside their home gym. For competitions like Golden Gloves tournament, these groin protectors are worn inside the boxing shorts. The following content will describe the Plus model and its features. Color Options: The Plus groin protector is available in black and red (classic version). Exterior Material: Synthetic leather covers the cup and padding portion of the Plus. This provides a durable surface that is easy to clean. Elastic Waistband: The elastic waistband loops through a plastic D-ring and allows its user to adjust its tightness. An additional elastic strap runs through a leather loop on the bottom of the cup and connects to the opposite side. This strap secures the cup in place. Hook and Loop Feature: This waistband incorporates hook and loop fasteners, commonly known as velcro, that are stitched onto the elastic waistband. The hook and loop feature gives you the ability to quickly put on the groin protector and tighten it by yourself, unlike the groin protectors that are laced up. Cup: The groin protector consists of a hard banana-style cup made out of plastic. The interior side of the cup is simply covered in leather while the side facing outwards has a thin padding positioned between the leather exterior and the plastic cup. Padding: Two layers of light foam padding are used to protect the pelvic area above the groin. The interior layer that makes direct contact with your pelvic region consists of a firm foam padding, while the other layer is made out of a soft foam material. The total thickness of these two layers is approximately 1 inch. Upon putting the Plus groin protector on, the top of the padding should be positioned right under your belly button. 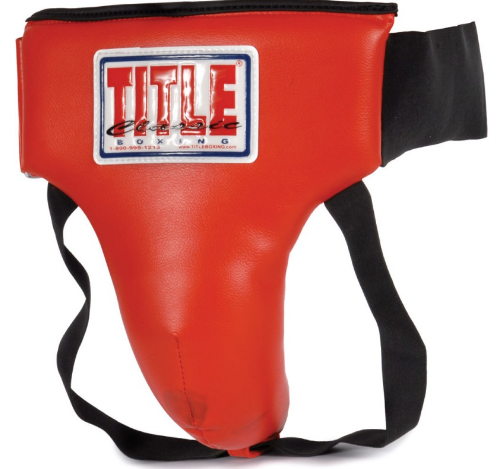 Title Boxing Groin Protector Plus low profile design makes it a light-weight protective gear that is comfortable to use for long sparring sessions. Due to the lack of padding on the sides, you can use this groin protector for kickboxing sparring as well, since it does not hinder your kicking motions. I actually bought this groin protector for kickboxing, and not for boxing, to protect myself from accidental groin kicks. Originally, I used compression pants designed to be used with an insert cup. I have found the Title groin protector’s cup to fit better and feel more secure due to the elastic strap holding the bottom of the cup in place. Furthermore, it is more convenient and faster to put on, which is great when I have to quickly go from grappling class to striking or vice versa. I wear my Plus groin protector outside my MMA shorts. As I continue to train with it, the cup is barely even noticeable. A complaint I have about the hook and loop fastening feature is that the piece of velcro used is slightly shorter than I prefer. When I tighten the groin protector to obtain a snug fit, part of the velcro section will hang loose and not attach to anything. This increases the chances of the straps coming loose during training. 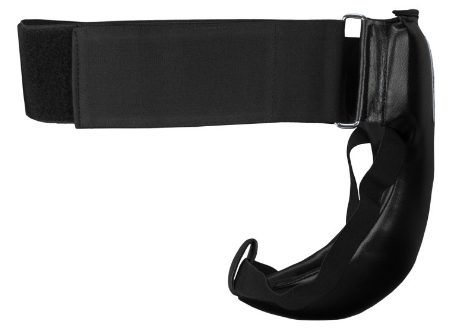 Additionally, the velcro design does not allow it to fit as tight as groin protectors with laces. So far, my Plus groin protector is still in pretty good shape. The most obvious sign of wear can be seen at the ends of the leg straps. This part of the elastic strap has started thinning out and is probably the biggest question mark for the groin protector’s long term durability. The synthetic leather surface has shown great durability and looks basically brand new. The groin protector’s stitchings have also held up well. The Plus groin protector has provided me with great protection during boxing, kickboxing and MMA sparring sessions. However, it does not have any padding around the cup’s edge like the more expensive options. Moving around with the Plus groin protector is not as comfortable without this padding and when you get do get hit in the groin, the cup’s edge digging into your body is not a great feeling either. In addition to that, the downside of the Plus groin protector’s low profile design is that it does not provide the same protection as full groin and abdomen protectors with wraparound paddings. The price range for a brand named groin protector starts as low as $10 and goes up to $200 and above. The Title Boxing Groin Protector Plus’ price ranges from $15-30 depending on the season. This solid and effective protective gear is great for beginners and those on a tight budget.